That headline sounds cliché I know, but it is true. Every basketball system manufacturer on the planet wants to 1, have you buy their product; and 2, buy their replacement parts for their product. Thus, Lifetime Products, Spalding, Huffy, Goalrilla, Goalsetter, Mammoth, and every other maker you can think of has their very own design and specification for their rims. Not only that, these manufacturers also have various forms of rims inside their product line as well that are, you guessed it, not always compatible. Now, this is not necessarily a diabolical scheme to drive sales in increments of $50 for a rim; rather, these differences are often related to the level of basketball hoop you purchased. For instance, the rim found on a $200 system is not, and frankly should not, be the same rim on a $2000 system. So, here are a few rules of thumb to help you select the correct rim. Always pay attention to what you are ordering. If you have a Lifetime basketball hoop, you should not be looking and Spalding or Goalrilla basketball rims. In some rare instances, the bolt patterns mentioned in a product listing give the hint that maybe they are the same as the bolt pattern you have. Don't get tripped up on this. Even if your Lifetime basketball rim has the same bolt pattern as the Spalding rim you want to replace it with, do not buy it. It will not work. After you have determined the manufacturer of your system and found replacement rims by that same manufacturer, now is the time to investigate bolt patterns. Bolt patterns refer to the distance up and down and side to side of the mounting bolts for the basketball rim. In most cases, manufacturers have a large variety of basketball system products and will likely have different bolt patterns for different qualities of rims. Potentially, this rule could have been your first step. If you find a rim that is the exact same rim model as the one you have, you are good to go. However, that is not always possible. Sometimes, for instance, manufacturers have a range of rims that a basketball hoop owner might be able to use to upgrade their current system. This type of design describes Spalding's line of basketball hoops. On most of their systems priced $400 and cheaper, the rims are entirely interchangeable allowing you to upgrade as you see fit. Back to the point of this step though, if you match model with model, you are sure to succeed. For instance, if you have a Lifetime Slam It Pro basketball rim, then purchasing a Lifetime Slam It Pro basketball rim will always be compatible. Standard Basketball Rims - Lifetime Basketball Accessories 5818 Standard basketball rims from Lifetime Products. The 5818 is a steel ring that mounts to most Lifetime Backboards. Order your basketball rim today. 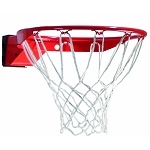 Lifetime Basketball Rim - 5820 Orange Slam-It Rim Lifetime replacement basketball rim model 5820. The 5820 orange Slam-It rim is a regulation, 18-inch diameter. Lifetime Basketball Replacement Rim - 5000 Breakaway Orange Slam-It Pro Hoop Lifetime orange Slam-It Pro basketball rim. 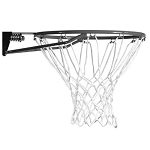 The 5000 replacement basketball rim features Lifetime Products breakaway rim mechanism. Similar to NBA-style basketball rims. Spalding Basketball Accessories 7811s Red Standard Rim White Net HUFFY Basketball Hoop Standard Rim w/ Net #7811. This is great for basketball accessories replacement equipment. Huffy Spalding Basketball Accessories 7800s Slam Jam Red Replacement Rim Huffy Slam Jam Basketball Rim - Great Replacement Rim for damaged rims on your existing basketball hoop. Red Spalding Basketball Accessories Huffy 7888SR Pro Slam Red Breakaway Rim Huffy Pro Slam Rim Huffy 7888 basketball standard replacement rim with net and universal mounting plate. Do you have anything with a 3 in wide hole pattern? the height can be anywhere from 4 to 5 in . What brand of rim do you have currently? Hi! I have a basketball system at home with a bent rim and am looking to replace it. It has a unorhodox bolt pattern. 6.8cm up and down, side to side 10.5cm (2 7/8in x 4in). The system was bought a long time ago and any brand or model is unknown. No brand or logo on the backboard.